I've mentioned this once or twice over the existence of the blog, but I'll say it again. I love Woody Allen films, but to coin an old phrase, let's call a spade a spade, his films over the past decade have been nothing short of over-indulgent parodies of the sub-genre he made famous with stunning classics like Sleepers, Manhattan and Annie Hall. Films like Match Point and Cassandra's Dream were, simply, just horrid pieces of cinema. Pretentious? Yes. But enjoyable? Certainly not. Having saved the last piece of creditability he had with the delightful romantic comedy, Vicky Cristina, Barcelona, he finally moves his trade back to, where his most brilliant works were born, New York in Whatever Works. Attempting to impress his ideologies on religion, relationships, and the randomness of existence, lifelong New Yorker Boris Yellnikoff (Larry David) rants to anyone who will listen, including the audience. But when he begrudgingly allows naive Mississippi runaway Melodie St. Ann Celestine (Evan Rachel Wood) to live in his apartment, his reclusive rages give way to an unlikely friendship and Boris begins to mould the impressionable young girl's worldly views to match his own. Over the past 10 years there has been mass hysteria for Allen not doing what he does best, which is clever post-modern tales in urban jungle that is New York. Yes we cried when he moved his trade to London, we despaired when he took it to Europe, and just when we were ready to banish him into the "has been" file he got it just right with Vicky Cristina Barcelona, however all was still not forgiven. So why is it, he finally moves back to his homeland, something feels missing? The entire plot, the dialogue, the outrageous characters, its all text book Allen. None of these characters would have looked completely out of place in films like Manhattan or Annie Hall yet the whole production felt so superficially hollow. The cast themselves worked well with the script they were given, Larry David in particular channelling the types of performances which made him famous in the wonderful Curb Your Enthusiasm. Evan Rachel Wood continues to show how versatile an actress she is, in the role of Melodie, which was as curiously innocent as it was endearing - poles apart from her emotionally heartbreaking role in The Wrestler. While Patricia Clarkson and Ed Begley Jr are completely outrageous as Wood's estranged (trust me when I say I use the term lightly) parents. So the cast were excellent, the scenery was pleasant, but the writing from Allen was too familiar and overly pretentious - even by his standards. There was nearly an underlining impression he has, unfortunately, ran out of ideas and resorted to stealing material from David's brilliant Curb Your Enthusiasm. 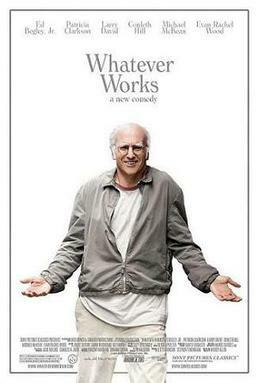 Whatever Works is in selected UK cinemas now, while American audiences can purchase the film on DVD & Blu-Ray.